WC13 | Joseph Kosinski Talks Oblivion, Tom Cruise & Tron 3 | Radical Studios, Inc.Radical Studios, Inc.
Oblivion might not have had a panel at WonderCon Anaheim, but it did have a presence. The movie’s Bubbleship was placed on the exhibition room floor, allowing fans to get an early taste of the new sci-fi vehicle before Oblivion arrives in theaters April 19. 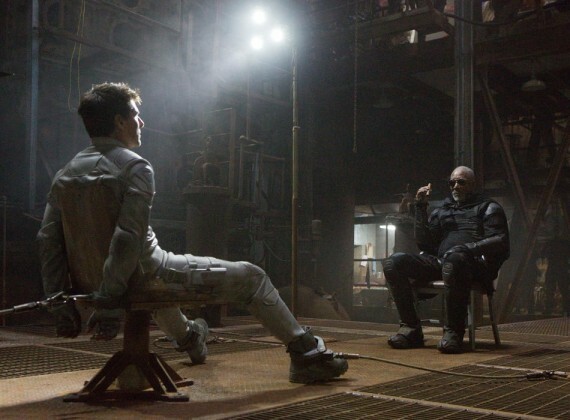 Oblivion is Kosinski’s second film, and he said he learned a lot since making 2010’s Tron: Legacy. He lamented that the script wasn’t as tight on that movie as he would have liked, so he made a concerted effort to make sure he had a solid story for Oblivion. He also confirmed that this film is less CGI-heavy than Tron: Legacy was, with a focus on using as much in-camera as possible. Kosinski was inspired by ’70s “lonely man” sci-fi films like Omega Man and Silent Running when he came up with the idea for Oblivion. He actually devised the story in 2005, so he’s had eight years to marinate over concepts like the Bubbleship and the Sky Tower, which can be seen in the Oblivion trailers. Kosinski only recently wrapped the IMAX cut of the film, and he said it was sad to finally be finished with the project. To help solidify the ideas behind Oblivion, Kosinski made an illustrated novel with Radical Publishing in 2007. The idea was for it to be a pitch kit to bring to studios to give them a sense of the world he wanted to create. “I went off, I made Tron, always kind of working onOblivion in the background, and by the time Tron was finished I had this kind of package of materials that described the whole world visually to go along with the story I’d written,” he said. If the movie strikes a chord with audiences, Kosinski said he would consider creating more graphic novels to expand the universe. “We’ve created a world, we’ve created a history, so yeah if there’s a desire from an audience to know more about what happened before and after a movie, it’s a fun thing to think about,” he said. One of the big draws of Oblivion is that it stars Tom Cruise, and Kosinski said he turned to actor’s experience during production. Kosinski would frequently ask about his time working with directors like Stanley Kubrick and Paul Newman, and said he enjoyed hearing advice from an actor who played a character in the film. Kosinski also said he has some ideas for other new movies after Oblivion, although he’s not sure which one will be selected by a studio at this point in time.